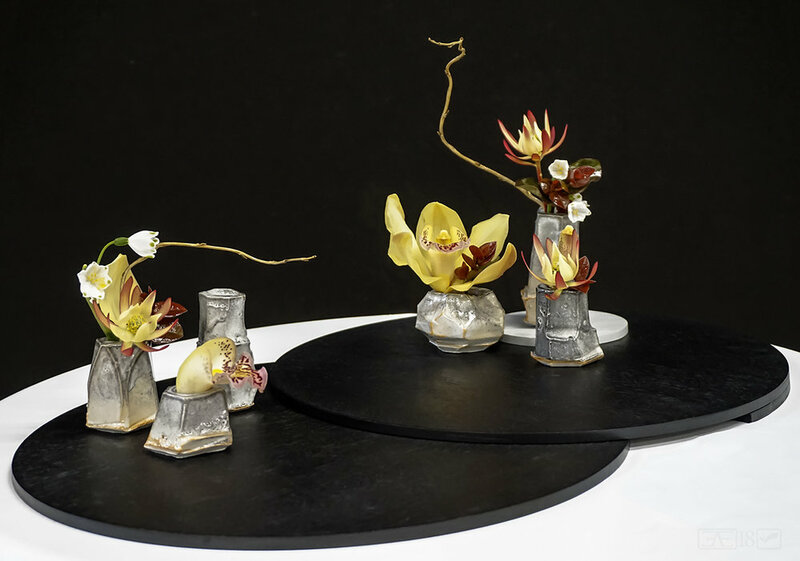 Recently I had the good fortune to be able to attend an event in Auckland which was in celebration of the 50th year of Sogetsu Ikebana in New Zealand. There was an exhibition, demonstrations by Master Ken Katayama, who was visiting from Sogetsu Headquarters in Japan and there were also two days of workshops. Overall it was a fantastic experience, I participated in the exhibition and enjoyed both days of the workshops. The venues in which the exhibition and demonstrations as well as the workshops were held were excellent and the organisation by the members of Auckland branch was very professional indeed. The whole affair was very impressive. The following gallery shows a selection of some of the demonstration works by Master Ken Katayama. Again not all of the works are shown due to having visual elements or distractions in the background. Last but not least is my work from the exhibition, which was the only miniature arrangement. I feel that being the only miniature made it stand out and engage the audience in a different way. It invited them to come close to see what it was about. My feeling is this was a good thing as it made my piece memorable. Since getting back from my surgery break things at Raku Dining in Canberra have been going full steam ahead. I identified a couple of new spaces that had potential for displaying arrangements in the restaurant. 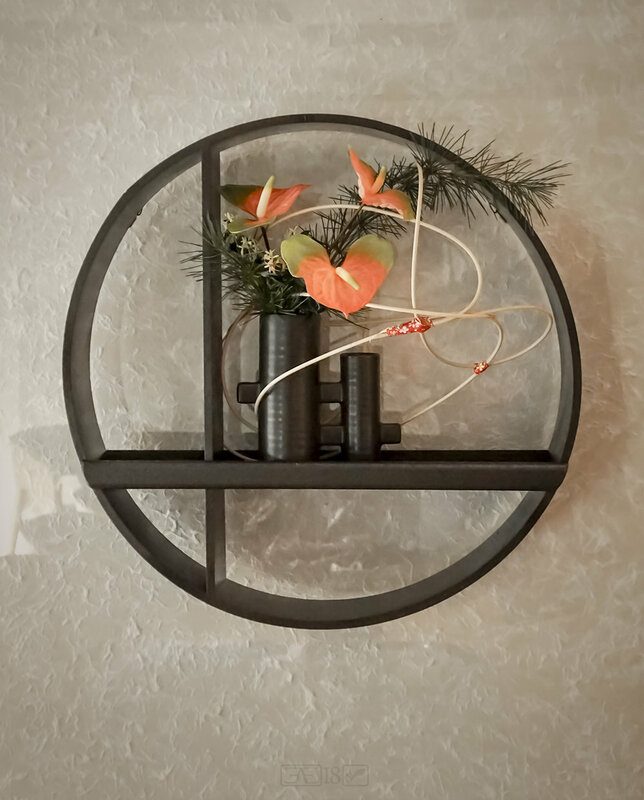 The challenge in this case however was to create arrangements that can be displayed on the wall. With that in mind I set about making new containers as I didn't really have containers that would be suitable. This time I decided to make some from timber in which I could hide a glass container for the water. The result was very satisfying. The following week I decided to revisit making relief arrangements for the wall spots as I found this quite an enjoyable exercise during the course of my studies. So I collected some of my dry materials and painted them, soon I was all assembled and ready to hang. 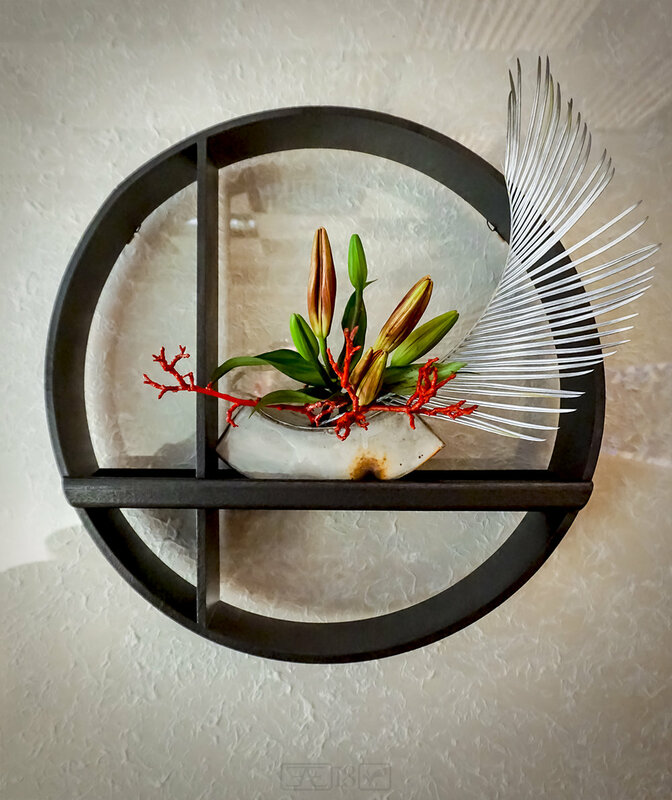 I also developed a new way to show arrangements in the private dining room by suspending a customised circular shelf using fishing wire. The private dining room is a tricky space for arrangements, the table is relatively narrow and all the surface is needed for serving meals and the room is cosy meaning anything poking out can be easily knocked. There really are only a couple of spaces where arrangements can be displayed without being at risk of being bumped or knocked. By using my own shelf suspended from the ceiling up against a wall it means I can try out different spots around the room untill I find one that works best. It also means I can use standard containers without always having one specifically designed to go on the wall. Here are the shelf based arrangements so far. As per usuall I also provided arrangements for the main space in the restaurant, although some I dont have photographs for. In keeping with what I was making for the hanging spaces on the wall I went for dry materials, some of which were painted and some left in their natural state. The benefit of dry materials being that they can last as long as needed, although one doesn't want to leave them tooooo long as people may become bored if they see them too often. More Raku happenings coming soon. Lately I have been having a bit of an epic run of attending many classes, working hard and powering through book 5 of the formal Sogetsu curriculum. On top of that there have been exhibition entries, workshops with masters and more arrangements for Raku (more about those in a different blog entry - stay tuned). On top of that I've been bevering away are making new containers and sooo many other things I won't mention them all here. Suffice to say things have been a little hectic. Following is a selection of my most recent class work typically I would include some commentary on each arrangement but in this case I feel much of the work is self explanatory. Please sit back, relax and enjoy scrolling through my most recent works. As I mentioned in my previous blog entry, my teacher had gone away for a little while earlier in the year and while she was away had set us some homework (see previous blog entry). Since her return there have been a number of classes that I attended and I was able to make some nice arrangements, a few of which have been added to the current gallery on this website. I thought it useful to add some here and talk about the brief for each one so as provide a fuller picture of the classes. 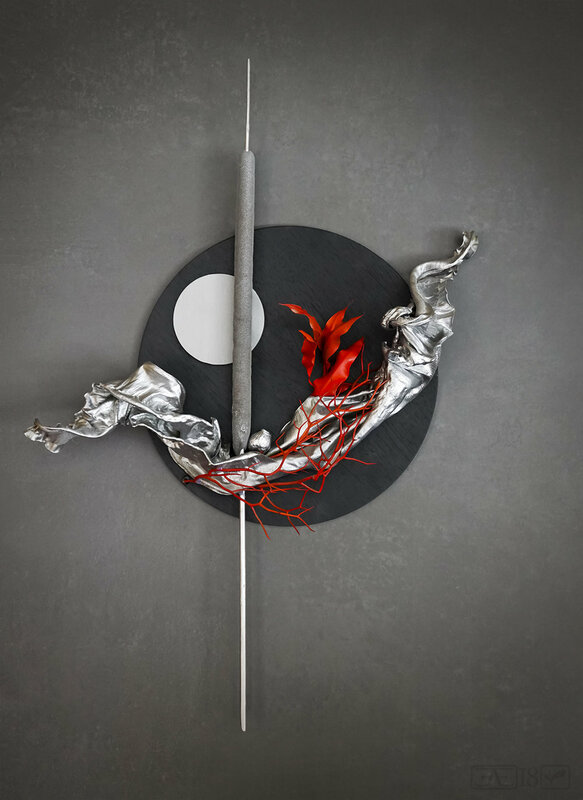 Above are some images of an exercise in creating a hanging arrangement that might go in the centre of a room or in an alcove or somewhere that might otherwise suit such a thing, over a table perhaps?.. There are a couple of considderations to think about for this kind of arrangement not the least of which is that it needs to be attractive from all sides, including from below! Another thing that I had to keep in mind was the container. Hanging containers are actually quite hard to find outside of Japan so I decided to make my own using a number of lengths of bamboo and some rattan cane. I didn't want the container to overwhelm the flower arrangement so I painted it green and silver so as to blend in more as it came closer to the top. I felt this was quite a successful container and was pleased with the result as well as the arrangement as a whole. 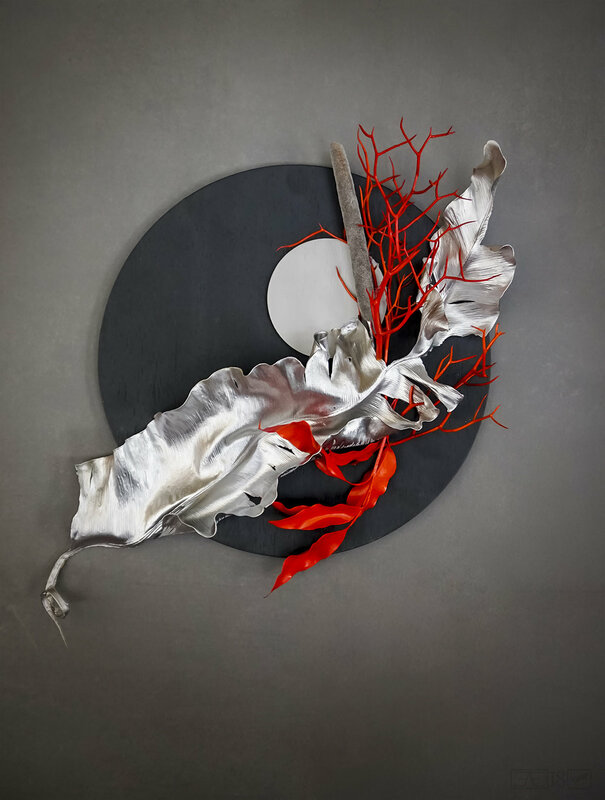 Another arrangement from class was to create something that hung on a wall using fresh material. The suitable ceramic containers my teacher happened to have on hand were a little on the small side and so she offered that if I'd like to use some bamboo from her garden we could make a container out of that. So on the spot we took her bamboo saw and set about cutting a suitable piece of bamboo. Making the hole was an interesting exercise in itself and we achieved a nice result using a small saw, a hammer and a very sharp florists knife. We made a small drill hole at the back of the top and it was ready to go, only needing the flowers to be arranged. I wanted to keep it quite simple and very natural looking so I didn't want to manipulate the materials too much. One chrysanthemum, a little viburnum and a couple of tendrils from a groundcover (I forget the name of it) were all that was needed to make a very soothing feeling arrangement. The above shows a relief work using dry and painted materials. Here I wanted to use a more interesting shape than just a square and so I created a hexagon out of 3mm craftwood. I also wanted to break up the surface a little by adding a couple of additional hexagons in different sizes and some wire mesh. Finally I painted the whole base using a textured paint, again to ensure that it didn't all feel too flat. My next step was adding the plant material which I had prepared in advance. Placing everything first to get a sense of the composition I them had to find appropriate ways to fix things in place.. I made a couple of small holes in the base and in some places used wire, other places were more suited to hot glue. It was very much a case of what was going to work best in the particular spot with the specific material. The final result is as you see above. I was very pleased with the outcome and I'd like to do this exercise again as I really enjoyed the different approach. The next day of classes was also very exciting. Pictured above is my arrangement for the exercise "arrangement complimenting an artwork". I wanted to do something quite bold and caligraphic but at the time I didn't have any artwork that would really be suitable so I got out my ink set and began to paint. I liked the Kanji "kokoro" for the idea of heart/spirit/passion and created caligraphy using some dried shredded gymea lilly foliage that I had made into a brush. 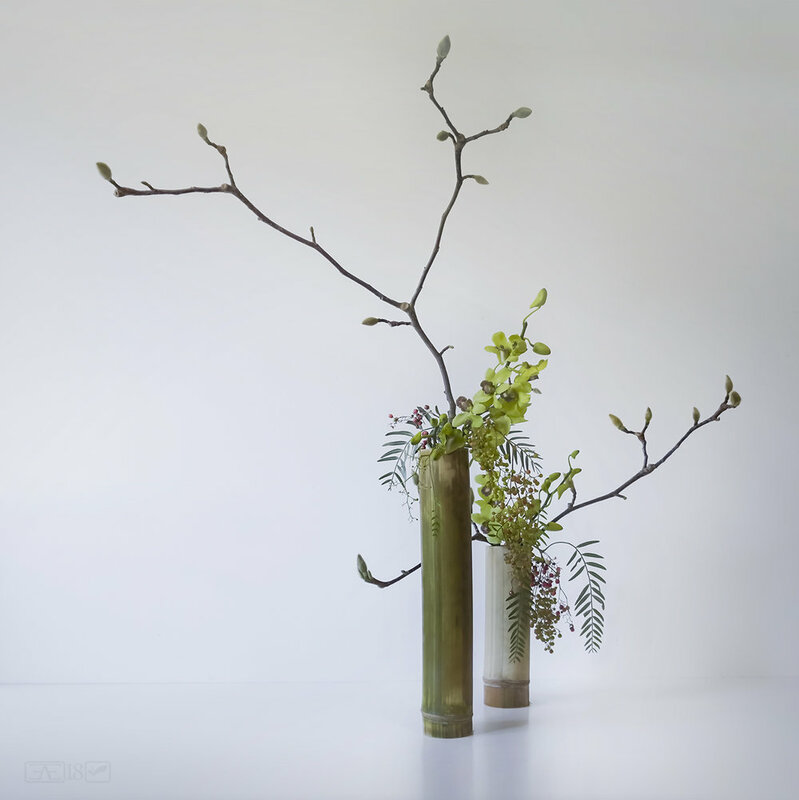 I liked the elegance of the idea, painting using old ikebana plant matter to create an artwork which I would then make a new ikebana arrangement to compliment. There was such symetry to that concept I felt I simply had to do it. 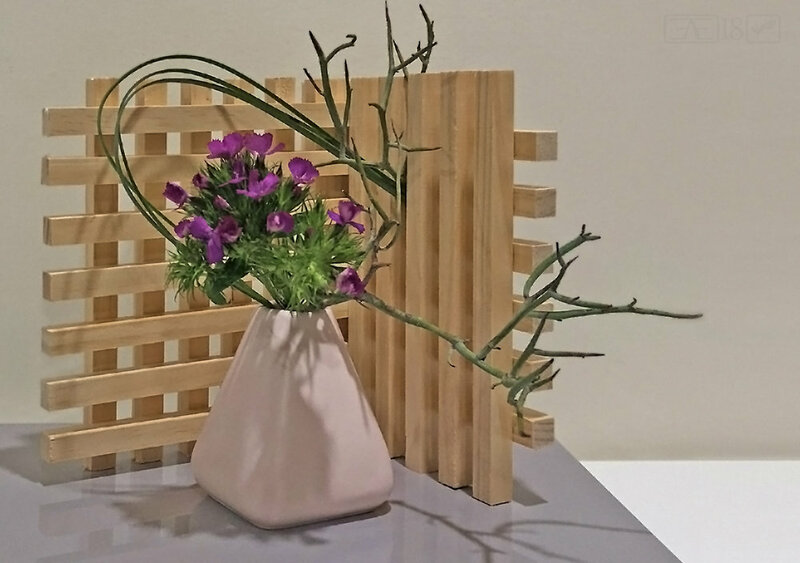 Pleased with my artwork, the excited lines capturing the passion and excitement of the heart (in making ikebana) I set about creating my arrangement. 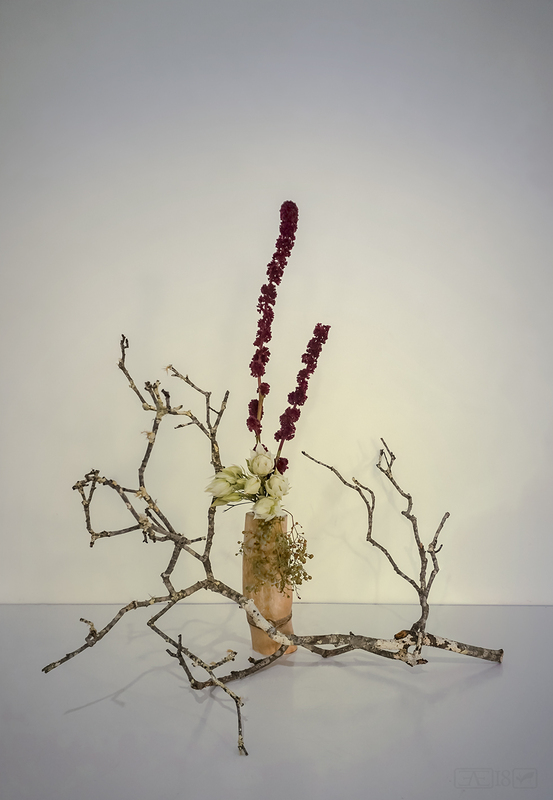 Here I used the bark of the snow gum (eucalyptus) which I assembled with wire and wood glue, and combined it with red spider orchid. I feel the raw shapes of the bark really echoed the lines of the caligraphy in a raw and powerful, passionate way and almost created a 3D character! The red obviously reinforcing that idea of a passionate heart. My teacher and I were both very pleased with this arrangement and I re-created it again once I got home. At the time of the class even though I had completed many of the lessons in book 5 I hadn't yet done a seasonal arrangement, but it being autumn at that point I thought I would be a good time to try that particular lesson. Using only materials from my teachers garden I created the above arrangement. I focussed on the lovely movement in the ornamental grape vine and also on the colours, predominantly keeping to colours that sit close to each other on the colour wheel with just a small touch of green for contrast. I was happy with the arrangement as was my teacher who enjoyed it in her home on the mantle shelf for several days. Also on the day my teacher asked me to create a second seasonal arrangement but using only one kind of material. Luckily I had brought some lovely Japanese maple with me from home! This was a fun exercise and I really enjoyed the result. The final exercise for the day was a revision of creating lines at the base. Here I used crab apple branch, red spider orchid and a small strip of New Zealand flax. A very satisfying end to an extremely productive day. Thanks for reading and more to come soon. It's been such a long time since I made an update here and so much has happened! A part of my absense was due to having some surgery, which all went very well (no need to worry it was not anything life threatening). In the lead up to the surgery there was a little bit of a break and then following the surgery there was a bit more of a break to help me have a good recovery, which is also going brilliantly. 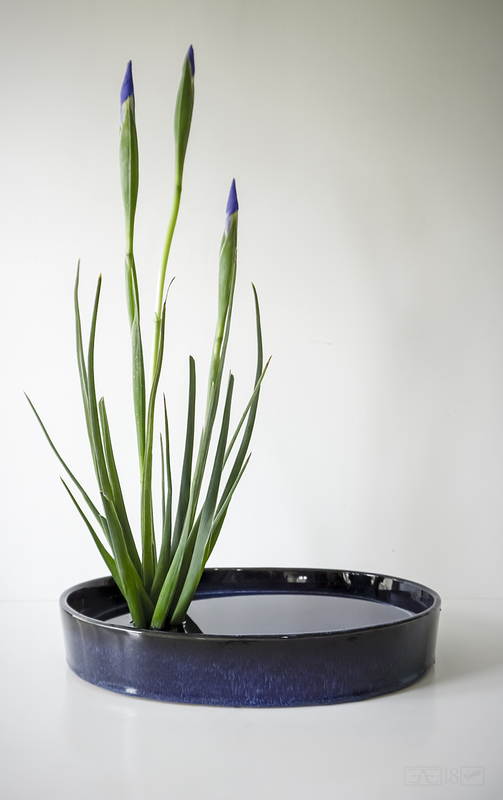 Back to the topic at hand though... Ikebana things! Lets first take a little look at what was happening at Raku in my lead up to being away. I suspect that I had a few more arrangements in the restaurant but I'm a little bit hazy about it and these seem to be my latest photos. 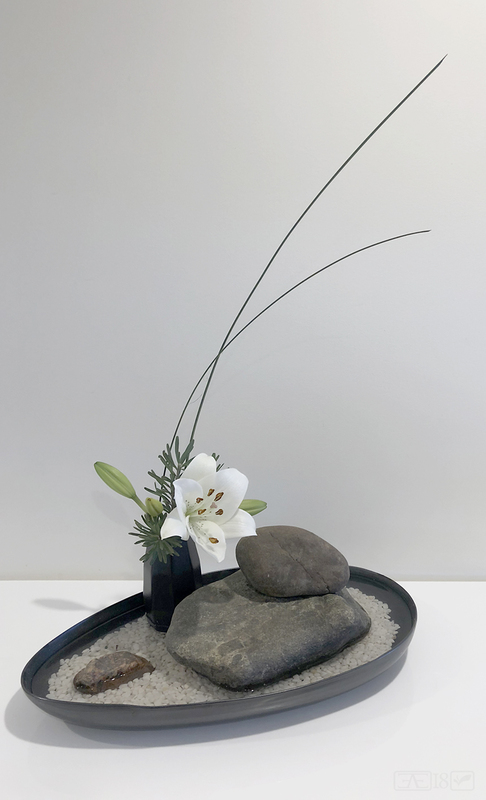 Fortunately another local Ikebana artist, Sachie Terasaki was kindly able to provide the restaurant with some lovely arrangements in my absense and from the 5th of July I'll be back into the swing of things with new arrangements in the restaurant so watch this space for more in the near future. I have been doing quite a few things at home as my teacher, the most excellent Sandra Marker had been away for a while leading a tour in Japan. Sadly I was not able to go along this time but I hope to make it for the next trip. Although Sandy being away didn't mean the rest of us students had time off!! Indeed Sandy set homework for us. The first exercise was inspired by the work of Isamu Noguchi, an artist who works extensively in stone. He designed the foyer/exhibition space of the Sogetsu Headquarters building in Akasaka, Tokyo. The assignement was to feature stone in an arrangement. I made two arrangements, one in a natural environment which was lovely but difficult to photograph and another arrangement at home, see below. The following exercise was inspired by the work of Kengo Kuma a very famous architect from Japan whose work has gained worldwide acclaim. His work often features wood and utilises repeating patterns or geometric structures. In meeting the requirement I kept my piece quite small and simple. A third exercise was inspired by the cityscapes of Japan. For this I did a miniature arrangement using containers that I had made which looked a bit like little buildings. Finally a little more recently my teacher set another piece of homework even though she was no longer travelling in Japan. In this case, because it is the middle of winter here in the southern hemisphere, the brief was to create an arrangement that captured the essence of winter... I feel that this was the most effective of my homework exercises and I was really happy with the result. As this post is getting a little bit long I shall make another entry shortly with more recent happenings. Stay tuned folks... more coming soon. 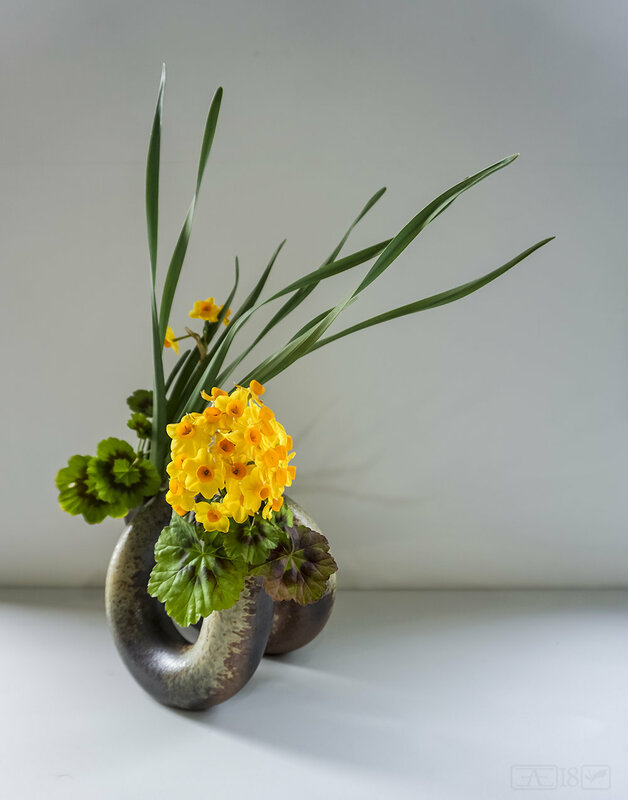 As always my works at Raku continue and the restaurant have been pleased with my arrangements each week. Here are some of the most recent works. 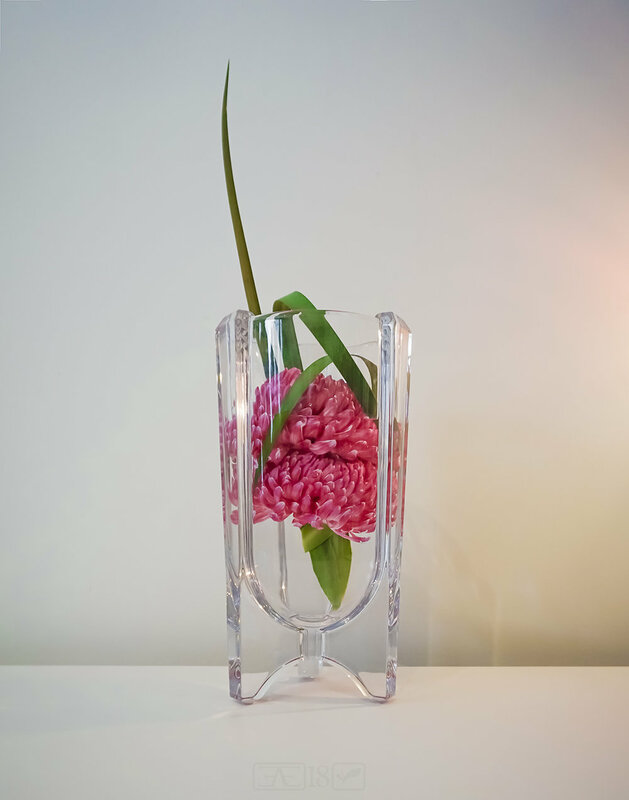 This arrangement, when in the restaurant was a little difficult to photograph and so I made sure to photograph it at home instead.